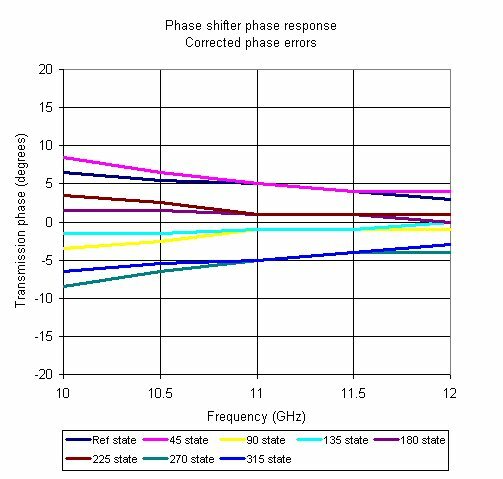 We've seen the RMS phase calculation for a phase shifter screwed up so many times we want to present it here once and for all, in plain English! There are two traps that engineers fall into in this calculation, which we will identify. 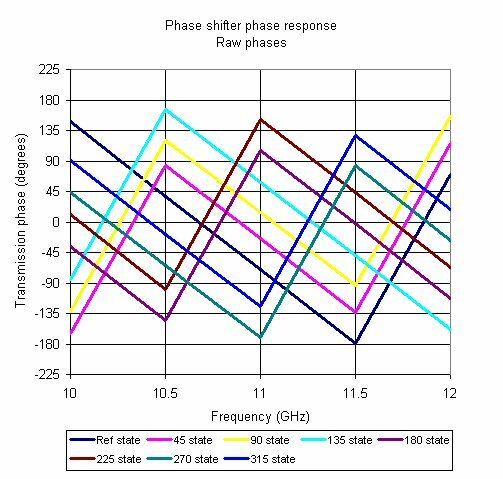 The main application for digital phase shifters and attenuators is in phased array systems. New for December 2011: what is wrong with these pictures which were cropped from a datasheet from a certain MMIC supplier with a facility in Lowell, MA? That seems like a reasonable explanation, thanks! Now we will sit back and wait for the foundry to tell us that's what they meant... Now back to the discussion. While we're on the subject, here's a trivia question... why are there 360 degrees in a circle? The same reason there are 60 minutes in an hour, and 24 hours in a day... because ancient mathematicians didn't have decimal digits, they wanted to use numbers that are divisible by as many smaller numbers as possible. They succeeded, 360 degrees is divisible by 2, 3, 4, 5, 6, 10, 12, 15, 18, 20, 24, etc! And so on. By the time you get six bits, the LSB is 5.625 degrees (360 divided by 64). Everyone knows you will never be able to split phase that accurately, so please refer to the lower order bits as 5.6, 11 and 22, not 5.625, 11.25 and 22.5, OK? We've seen designs that go up to eight bits, but typically you will see digital phase shifters with three, four or five bits. One more thing to keep in mind, which will add to your confusion at first. 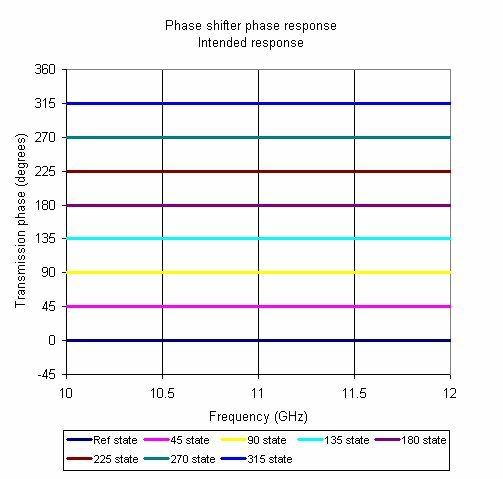 The convention that phase shifters follow is usually that the high-pass state is the reference state, and the low-pass state is the shifted state, which results in negative phase shift. But when the states are plotted or used in error calculations this convention is often thrown out the window because people don't like looking at a Y-axis that is negative. Now on with the calculation! Let's give an example of a three-bit phase shifter. 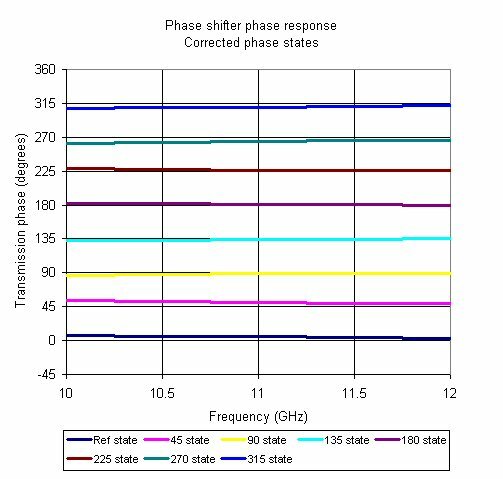 We faked some phase data for eight phase states and put it into Excel. It's not like TriQuint or M/A-COM supplies full data on their phase shifter products! The plot below shows eight transmission phase states (thanks to Yoko for correcting us when we couldn't count!) 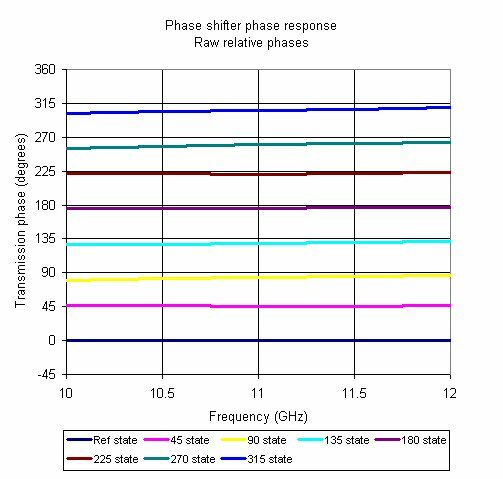 The downward slope of each phase state would be caused when phase shifter devices are measured in an electrically long fixture. Next we calculate seven raw phase states by subtracting the seven shifted states from the measured reference state (for now the "reference state" will be exactly zero degrees). But what happens if you merely subtract the phases of each state from the reference phase? You get a mess because the phases were all constrained to -180 and 180 degrees! That's fixed it! Now we see the 45 bit is near perfect, while the 90 and 180 bits each fall short. The 315 state is the shortest, because it is constructed of the three bits, two of which were short. Dig? Although it is possible to calculate an RMS error from the above plot, it would be wrong, not only that, it would be pessimistic. The problem is that the true reference state is not the measured reference state. 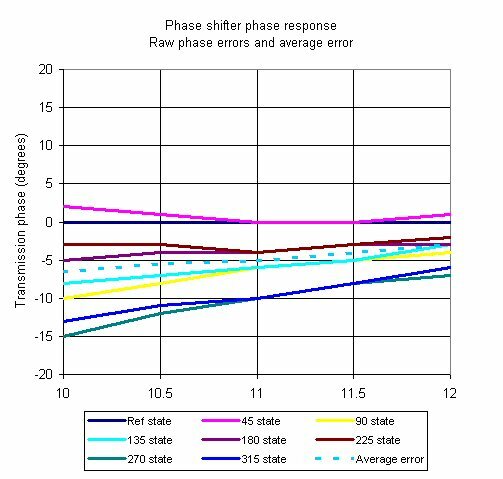 The individual phase errors are found by subtracting the raw phase responses from the intended response. In the plot below we can see that the errors are predominantly negative, because two of the bits came up short. We've also plotted the average phase error (dashed line) which is the sum of the individual errors divided by the number of states, in this case divided by eight. Because the reference state has no phase error there is a tendency for engineers to divide the summed error by 2^N-1 (seven in this case) but that is WRONG! Now we use the inverse of the average error (multiply it by -1) as our "true" reference state. 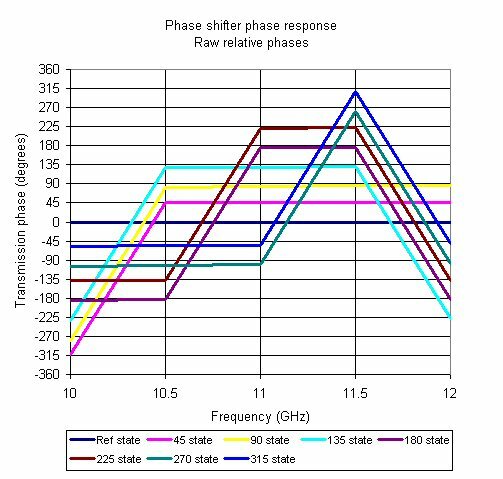 Here's the corrected phase states, see how its coverage of 360 degrees is more even, but the reference state is no longer perfect! The 180 state is now nearly perfect instead of being short. 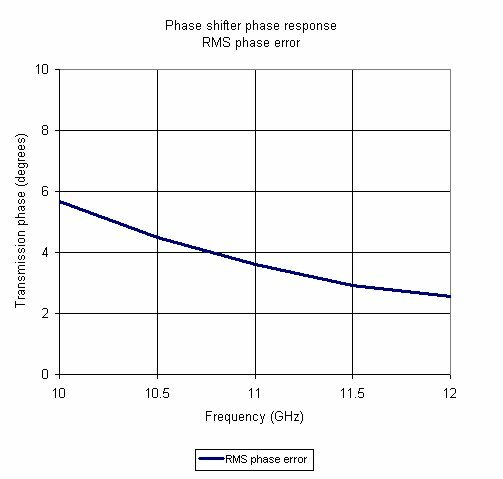 The RMS error is highest at the lower frequency, which is obvious from the plots of individual phase errors. It is also (necessarily) less than the worst-case phase error at any frequency. It all makes sense! If anyone wants a copy of the spreadsheet that we used to do this calculation, ask for it nicely and it's yours!